The 13-time Grammy nominee’s multifarious talents and far-ranging musical interests are prominent on Levitate, which marks the artist’s Verve debut. The album’s 13 songs span an expansive sonic and emotional palette, encompassing heartfelt insights and absurdist humor, while incorporating a broad assortment of influences within compact song structures. The material ranges from the expansive, expressive songcraft of “Prairie Dog Town” and “In the Low Country” to the gently reflective introspection of “Invisible” and “Here We Are Again,” with the album-opening “The Black Rats of London” offering a swaggering treatise on the influence of the rodents, insects and microbes upon key historical events. 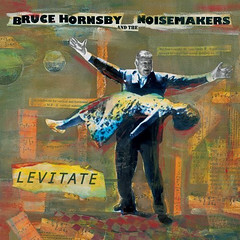 Such colorful moments help make Levitate a consistently compelling evocation of Hornsby’s established abilities, as well as a substantial creative departure.